Logitech is a Swiss company with a long history of producing some of the best accessories for the PC. They started with the computer mouse, and naturally diversified into keyboards, webcams and speakers. Today, we will take a look at the Logitech G502 Proteus Spectrum gaming mouse. 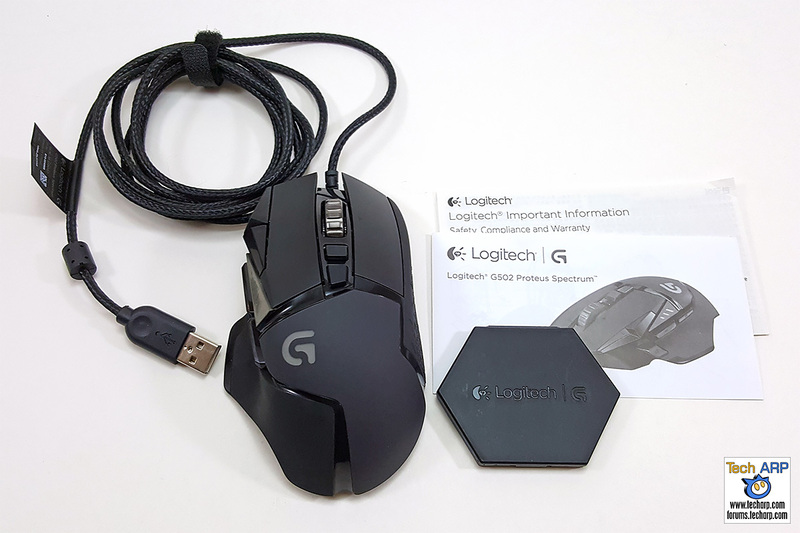 The Logitech G502 Proteus Spectrum replaces the Logitech G502 Proteus Core, its predecessor. It is an evolutionary upgrade of the Proteus Core mouse with customisable RGB illumination. Let’s check it out! Updated @ 2017-01-15 : Corrected references to 6 weights. There are only 5 weights. Updated other aspects of the review. The Logitech G502 Proteus Spectrum comes in a very nice cardboard box with full colour printing. You will find its key performance characteristics listed on the right side of the box, and its contents and requirements on the left side. The back of the box has a nice top view of the G502 Proteus Spectrum together with its key features. Join us as we unbox the Logitech G502 Proteus Spectrum in this video. Please ignore the typo about six metal weights. There are only five weights. The Logitech G502 Proteus Spectrum is a rather large mouse, designed for right-handed users with large hands. It feels comfortable even in my smaller hand. However, one of the side buttons was out of reach. More on this later. It has a nice curved thumb rest which doubles as a latch for the weight-tuning system (we have special section on this later in the review), and a full body for proper palm support. This may not matter though if you prefer the finger grip style of holding the mouse. In case you are wondering, it is only available in one colour – black. The top surfaces are all matte-finished to prevent unsightly fingerprint smears. It also has textured rubber strips on both sides for better grip.